Went to get our cart yesterday and a tire started coming apart on the trailer, didn't have a spare so I dropped the trailer at work and we went to go look at and pay for our cart. It's a small family run business, The father runs it and does deliveries , the son does the paint work and assembly, the sons wife does all the upholstery work. This cart is super bad, is top notch in every way and is flawless and my wife really loves it. She says it's the most beautiful Georgia Bulldog themed golf cart she has ever seen. While we were there I had them add a black carbon fiber steering wheel and get rid of the regular golf cart steering wheel. Since I had trailer troubles and they were not quite done with it they are delivering it to us today for free! The dealer showed me a way to register the golf cart as a low speed vehicle in Georgia and get a tag for it, and it's only 20 bucks a year! That way we can take it with us to the beach and legally us it in Panama City. Now just have to get the county tag office to give us one. They are usually a pain to deal with. Our new play toy to cruise the neighborhood and campgrounds! Nice looking cart. The yard looking good also. That was before I cut it. insurance called. trucks a total. Funny I answered the phone excited thinking it was tech support here to help me answer a question that no other company could about a certain axle torque specs. but I did kind of feel relieved. He said you could get it back. clean title. But I looked for parts, hard to get. parts, labor, I wouldnt much money on it at all especially if I tried to trade it in. So I guess the money will go towards the project/daily. The sound system and some other parts are/will be swapped over before the truck goes away, which means some improvements and betterments on the daily. Also means more time for the Ford... which is much needed. Also means, I could/will go car shopping for a car..... or just look around online until I see the deal. Not like last time, where I had to have it very fast. I should have waited it out a little while more. But with this, I do get more buying power as far as a down payment goes. And insurance premium drops almost 1200 for the 6 month. The reason they total something is it cost more than 75% of value to fix. If air bag deploys it pretty much a total. Sorry to hear about the truck, Never lost any to an accident but I have 2 cars I sold and then later on I kicked myself for selling. We are wide open at work now. We are slowly creeping up on beating out 2 other store on total service sales for the year, not bad since we opened in mid February. We now have every bay filled with something to work on and the delivery driver is always on the road. I told my boss it's about time I get an assistant because It's all I can do to keep up with work orders, dealing with customers and inputting new equipment. We also got our first Google review 2 weeks ago and a second one yesterday. They put me to sleep today and looked at my stomach, no issues there. Thursday is an appointment to tell me the results of the ultrasound I had like 3 weeks ago. They kinda let it slip today that there is a blood clot in the artery feeding my intestines. I guess I will find out what the next step is on Thursday. 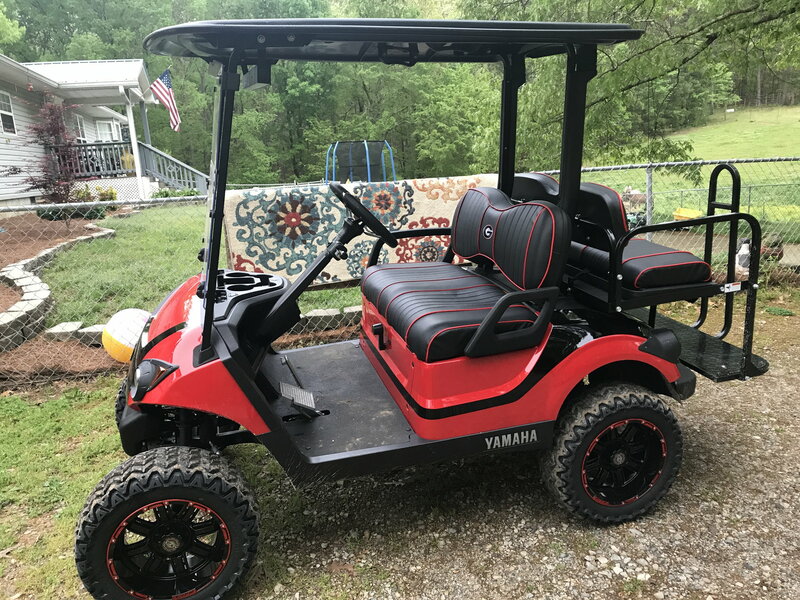 The wife loves the golf cart, she likes it better than the 4 wheelers. Decided to list the boat on craigslist. We are not going to use it and I can use the space to park the cart. actually they changed that. Its not 75 percent anymore. It goes off scrap value, appraised value, rebuilt value, blah blah blah blah blah. The couple of adjusters I have talked to outside of this also confirmed the system has changed. And its more complicated and stupid, which means that insurance will rebuild a car, even though it should be totaled and scrapped, if something in their system of calculations and libertarian mindsets and programs says its not a total. The adjuster working on my ****, was so stressed out over it. I thought it was kind of comical, then I knew right there it was a goner. which means I got out of the car business right on time! HAHAHA. Ill record and do my obligatory burnout in it, smoked out the place, get some pics. Itll be a memory. For sure my first vehicle I financed, so itll have a place in my heart. But the business and financial aspect of it, I will kick myself in the *** for ever buying it. You can have a little fun with it before it's gone. We have been super busy, slowing down a little right now but it will pick back up starting on Monday I'm sure. Waiting for the roll up this morning to see if we moved up above 3 other stores in total service sales. For sure. They are coming out monday to pick it up. took my license plate off. itll be out front sunday night for them to pick up. I did however take 3/4 tank of gas from it today. Ill fill all my equipement up at my property and work tomorrow, and then come back and see what else I need left to top everything off. Charge my gopro, and record a good *** burnout. Since the project is so loud, I got nervous the neighbors would be upset. Talked to one today, he was sad to see the other truck go. I apologized for waking him at 515 if I do everyday, he threw his hand up, said you have to get to work, and I dont mind it because you are a good neighbor. Thats the **** that restores my faith in people. even though its really 1 or 2 people I talk to outside of a circle a week. It's was a good ending to the week, slowed down a little so I got caught up on a lot of stuff. I told the new mechanic on Wednesday that he had 2 weeks to make a huge turn around on his work ethic or I was going to fire him. He will be working on a lawn mower and then just walk away and go see what's going on or BS with the other guys. The last 2 days he is a lot better at staying focused. Older man with a bad leg had his mower serviced by us,we load it up and 30 minutes later he came back with it. A weld broke under his deck on a grass deflector and the blade was hitting it. We got it down and I tack welded it back in place, no charge. It took all of 10 minutes. He went and bragged to the store manager about me personally fixing his mower after the mechanics left so he could mow the church grass before easter sunday. We were so good and fast that he is bringing in his other mower in to get fixed. Other than that one guy at first, (you can't please everyone) we have had nothing but great customer feedback. My boss is super pleased with the work I am doing. The AG side is doing real good but the turf side (mowers) for service and repair has exploded. I bought a customer trade in lawn tractor yesterday, I got it at trade in cost and she needs a little work but it's a much bigger, nicer and newer mower than my old worn out one. Part of the deal was I had to donate my old lawn mower to the shop, they want to make a racing mower out of it. I don't know when they will have time to do that right now but I'm like OK, whatever. I don't have to worry about the neighbors, we live wayback off the main road. There is one down the road that we talk too every now and then, wave as we go by on the golf cart but everyone else lives back off the road too and we never see them. A guy is going to look at the boat today, hope he buys it. Here at the house we have neighbors. Get along with some. We have a crack motel down the street. Lexie is not nice to them. They did not get it wnen she told them 1. She 62 2. She from Tx 3. She Irish 4. She has guns. I dont do anything before about 8 and try to stop around 6 at the latest.